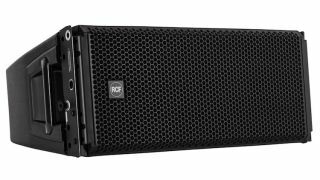 The What: RCF has expanded its HDL family of line array products with the HDL30-A. The What Else: A compact, 2,200-watt biamped two-way cabinet, the HDL30-A features two neodymium 10-inch woofers coupled with a 4-inch high-frequency compression driver mounted on a time-coherent, 100-by-15-degree 4PATH waveguide. RCF has specifically matched each component for optimal performance by manufacturing its own cabinets and transducers. Crossover point for the high-frequency driver is 680Hz, with woofers offering response down to 50Hz while achieving SPL levels up to 137dB. For added linearity, the HDL30-A includes FiRPHASE technology to optimize dynamics, amplitude, and phase patterns. The HDL30-A also includes RCF’s RDNet onboard. The proprietary, remote-controlled DSP gives real-time control and monitoring from the front-of-house location. RDNet allows for continuous monitoring the entire system and individual components, provides for system configurations including design of array angles with the built-in inclinometer, set EQs, and adjustment of gain and delay settings.